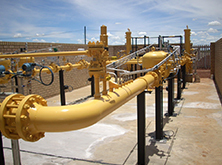 The project entails the Engineering, Procurement and Construction Management of the High Pressure Customer Metering Station (HPCMS) for Sasol Gas. The station design included filtration, volume measurement and pressure reduction of natural gas supplied to the Corobrik factory. The station was designed for a 4120 kPa pressure and maximum flow of 115 GJ/h. Project Management, Procurement, Construction Management, Mechanical Engineering, Electrical & Instrumentation Engineering, Civil Engineering.